As it hath beene often acted by the Queenes Maiesties seruants, at the priuate Play-house in Drurye-Lane. LONDON, Printed by A. M. for Iohn Waterson, and are to be sold at the Crowne in Pauls Church-Yard. 1630. 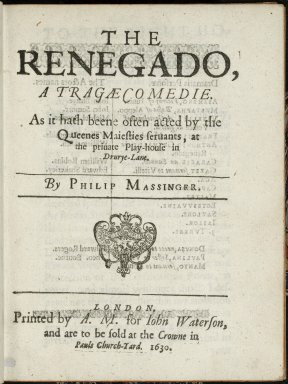 Title page imaged from Folger call number: STC 17641 copy 1. Image is not from the transcribed copy.